A former marine and Yale Law School graduate gives an account of growing up in a poor Rust Belt town that offers a broader, probing look at the struggles of America’s white working class. ...a compassionate, discerning sociological analysis of the white underclass that has helped drive the politics of rebellion, particularly the ascent of Donald J. Trump. Combining thoughtful inquiry with firsthand experience, Mr. Vance has inadvertently provided a civilized reference guide for an uncivilized election, and he’s done so in a vocabulary intelligible to both Democrats and Republicans ... Whether you agree with Mr. Vance or not, you must admire him for his head-on confrontation with a taboo subject. ...a quietly thoughtful, poignant look at life in the very places where the presumptive Republican Presidential nominee has garnered the strongest support. It provides a respite (and a much needed one, at that) from the shouting and the sheer noise of today’s political climate, with Vance choosing instead to adopt a tone of thoughtful reflection with a genuine desire for mutual understanding ... while the political timeliness of Hillbilly Elegy is undeniable, Vance truly shines when he takes us with him 'down the holler' into an America we thought we knew — until we realized how little of it we truly understood. Hillbilly Elegy is a beautiful memoir but it is equally a work of cultural criticism about white working-class America ... [it's] a riveting book, but it has a sobering message. 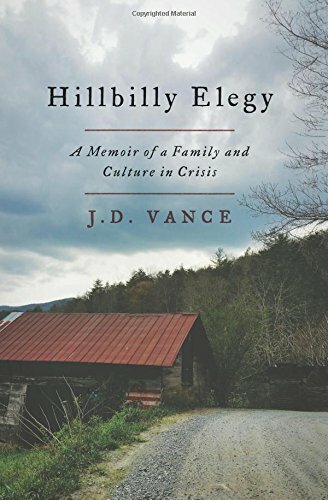 What did you think of Hillbilly Elegy: A Memoir of a Family and Culture in Crisis?